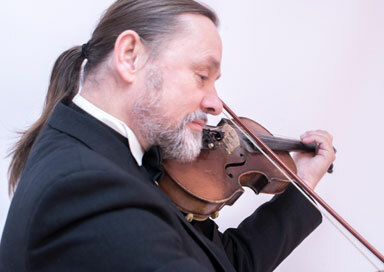 This Yorkshire wedding violinist is an experienced and versatile musician specialising in weddings, private parties, corporate events throughout Yorkshire and beyond. He uses professionally recorded backing tracks and play a wide variety of music including classical, pop, show tunes, folk, Klezma and Bollywood. He is also available as a duo with a young female violinist. All the couples he has played for have said that having a violin play their special tune for the bride's entry, and having tunes they know and love while they are signing the register followed by a stirring piece for them and the guests to walk out to, has been a highlight of their wedding. For the ceremony, he will arrive 30 mins early to set up, and play for up to 30 mins while guests are arriving followed by a piece of music special to the bride as she walks up the isle. He will play 1 or 2 songs while you are signing the register, followed by another wedding march or voluntary as the couple leave. He can collaborate with other musicians if you require, such as a church organist. He can also play during drinks reception/photos, for up to 45 minutes, playing a selection of light tunes and then play for the sit down dinner, including a wide selection of music from my repertoire. He would play as guests start to arrive, then play 1 or two sets, finishing when desert/coffee is served.